A Pope and a President in Poland In a good Warsaw speech, Trump invokes one of Pope John Paul II’s great 1979 orations. 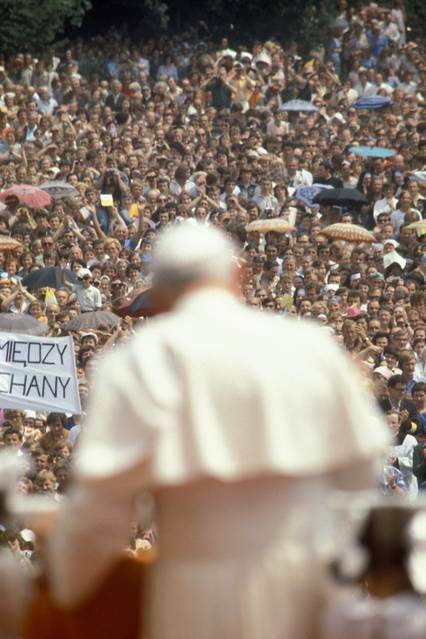 The greatest speeches given in Poland in the modern era were delivered in June 1979 by a pope. Ten months into his papacy, John Paul II sweetly asked the government of Poland for permission to journey home from Rome to visit his people. Europe was divided between the politically free and the unfree, on one side the democracies of Western Europe, on the other the communist bloc. Poland had been under the Soviet yoke since the end of World War II. John Paul knew his people: They did not want dictatorship, and a primary means of resistance was through their faith. Every time you took communion it was a rebellion, a way of reminding yourself and others that you answered to a higher authority. The Catholic Church of Poland survived precariously, within limits, under constant pressure, as John Paul well knew, having been a cardinal in Krakow for 11 years. What would happen when the first Polish pope went home? If Warsaw refused his request it would be an admission of weakness: They feared his power to rouse and awaken the people. But if they invited him they risked rebellion, which would bring on a Soviet crackdown and could bring in Soviet troops. They chose to invite him, calculating that as a sophisticated man he would, knowing the stakes, play it cool. He happily accepted their terms: It would be a religious pilgrimage, not a political event. The Polish government did everything it could to keep crowds down. Parade routes were kept secret or changed. State media would censor word of what was said and done. Grade-school teachers told pupils he was a wicked man in gold robes, an enemy of the state. John Paul was speaking not only to the faithful but to the rulers and apparatchiks of an atheist state. He did not explicitly challenge them. He spoke only of spiritual matters. And yet he was telling the government that Poland is the faith and the faith is Poland, and there is nothing communism can ever do to change that. More, he was saying: God is real. And God sees one unity of Europe. He does not see “East” and “West,” divided by a wall or a gash in the soil. In this way, as I once wrote, he divided the dividers from God’s view of history. Oh yes, he said, Christ wants that. At both events he was telling Poles that they should see their position differently. Don’t see Europe divided between free and unfree, see the wholeness that even communism can’t take away. The map makers think they’re in charge. We know who’s really in charge. At the end of the trip, at Krakow’s Blonie Field, a muddy expanse just beyond the city, there was again a public mass. The government refused to publicize it but word spread. Two million people came, the biggest gathering in the history of Poland. It is possible, John Paul said, to dismiss Christ and all he’s brought into the history of man. Human beings are free and can say no. But should they say no to the one “with whom we have all lived for 1,000 years? He who formed the basis of our identity and has himself remained its basis ever since?” He was telling the communist usurpers: You’ll never win. It sounded like he was telling them to be strong in their resistance to communism. This was a reassertion of the Polish spirit, and those who were there went home seeing themselves differently—not as victims of history but as fighters within a new and promising reality. At home they turned on state-run TV, which did not show the crowds and the chants but only a few words by the pope, and a few pictures. They were offended by the lie of it. It was another blow to the government’s claims of legitimacy. And so to President Trump’s speech in Warsaw. It was a grown-up speech that said serious things. Article 5, the NATO mutual defense commitment, is still operative. Missile defense is necessary. He called out Russia for its “destabilizing activities.” He spoke as American presidents once did, in the traditional language of American leadership, with respect for alliances. But he did it with a twist: The West is not just a political but a cultural entity worth fighting for. It is a real thing, has real and radical enemies, and must be preserved. If he talked like this at home, more of us would be happy to have him here. If he gives serious, thoughtful, prepared remarks only when traveling, he should travel more.